In this article, we had provided the latest information regarding the Gadchiroli Police Patil Recruitment 2018 Notification to fill up the 132 vacancies. The higher authorities of Gadchiroli District, Sub-divisional magistrate, Kurkheda & Desaiganj Subdivision organization had suggested the Online Application Forms under the 132 Police Patil Posts on their official site that is gadchiroli.gov.in. So, all the candidates who are interested to apply for gadchiroli.gov.in Jobs 2018 in Kurkheda & Desaiganj areas, they can focus on this page. From this page, competitors can get the details of गडचिरोली जिल्हा, उप-विभागीय मजिस्ट्रेट, कुर्खेडा आणि देसाईगंज उपविभाग Advertisement 2018 such as Educational Qualification, Age Limit, Selection Process, Salary, Application Fee, set of instructions to apply along with the important dates. Remember, the application process had started form 12th November 2018 to 26th December 2018. 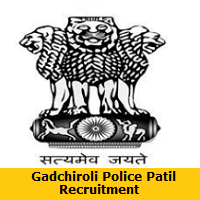 For more details, candidates need to check this entire article for Gadchiroli Police Patil Recruitment 2018. In the below table, applicants can check the details of Post-Wise Vacancies For gadchiroli.nic.in Jobs 2018 for Police Patil Posts in Kurkheda & Desaiganj according to area wise and the number of vacancies available in Gadchiroli District, Sub-divisional magistrate, Kurkheda & Desaiganj Subdivision organization. Here, the educational qualification plays a vital role for the candidates who applied for the Gadchiroli Police Patil Recruitment 2018. Applicants who are having an acceptable qualification which was given by the higher authorities of Gadchiroli District, Sub-divisional magistrate, Kurkheda & Desaiganj Subdivision, they can apply. Educational Qualification: Applicants has to complete their 10th class or 12th class from any recognized board in India. After viewing the information of education qualification, candidates must and should have to cross-check themselves with the details of Age Limit For Gadchiroli Police Patil Openings 2018. For details of Age Relaxation, applicants can check the Gadchiroli Police Patil Recruitment 2018 Notification. Candidates who had applied for the Gadchiroli Police Patil Recruitment 2018, they must and should have to attend for the Selection Process For Gadchiroli Police Patil Vacancies 2018 For Police Patil Posts in Kurkheda & Desaiganj. Candidates who had qualified in the written exam, they will get an attractive and best salary from the higher authorities of Gadchiroli District, Sub-divisional magistrate, Kurkheda & Desaiganj Subdivision. Candidates who had applied for this Gadchiroli Police Patil Recruitment 2018, they can pay the application fee on or before 28th November 2018. Candidates need to check the official site of the Gadchiroli District, Sub-divisional magistrate, Kurkheda & Desaiganj Subdivision organization at gadchiroli.gov.in. From there navigate to the Notice Section which is at top of the home page. If you are eligible, pay the application fee. And then proceed to fill the application form. Take two or more copies of Gadchiroli Police Patil Recruitment 2018 Application Form for further details. In the above article, we had arranged the complete and genuine details about the Gadchiroli Police Patil Recruitment 2018. For more fresh updates about the Gadchiroli Police Patil Recruitment 2018, applicants need to bookmark our site that is Sarkari Naukri by clicking the Ctrl+D. If candidates have any doubts, they comment us in the below sections. Thank You.